No time to wash your dog yourself? 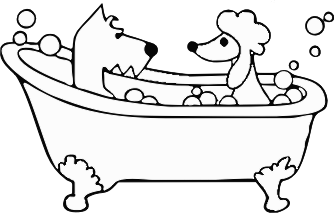 We have a service where you drop your dog off and we wash them, clean their ears, brush and completely dry them. We can also trim their nails if necessary. You can stay or we can call you as soon as your pet is finished (or you’re welcome to pick them up at a time convenient to you.) Giant breeds extra, dogs with excessive undercoat/shedding extra. Just drop in, no appointment necessary. Please allow at least two hours before closing. Full Grooming includes brush out, bath, drying, ear cleaning, nail clipping and hair cut. Pricing is based upon breed, hair style, and coat condition. Call us at 508-533-2833 to discuss your specific grooming needs. We schedule grooming appointments much like hair salons. We do not "assembly line" groom; your dog gets personalized attention and gets to go home as soon as he/she is completed; thus reducing their stress by making their stay as short as possible (great for older dogs). If your dog is a short-haired breed (lab, beagle etc..) you most likely just need the “we-wash” appointment below. Any questions just give us a call. Please call OR text to request an appointment. Please allow at least THREE hours before closing.